The Gipuzkoan derby between SD Eibar and Real Sociedad went the way of the Armeros, in a contest which the hosts completely dominated following Artiz Elustondo's 23rd-minute sending off. The game got off to an even start, as both sides looked to gain the upper hand, although it was Eibar who looked the more dangerous. In one of their forays forward, the ball struck the hand of La Real's Aritz inside the area and the referee pointed to the spot, before handing the visiting defender his marching orders. However, the Armeros failed to capitalise on the opportunity, with Pedro León sending his spot-kick high over the bar. Despite having squandered the chance to have got their noses in front, José Luis Mendilibar's charges didn't dwell on the penalty miss and began to take control of the game, without ever managing to fashion any clear-cut opportunities. Eibar had plenty of play in and around Gerónimo Rulli's penalty area, but were unable to finish their chances. 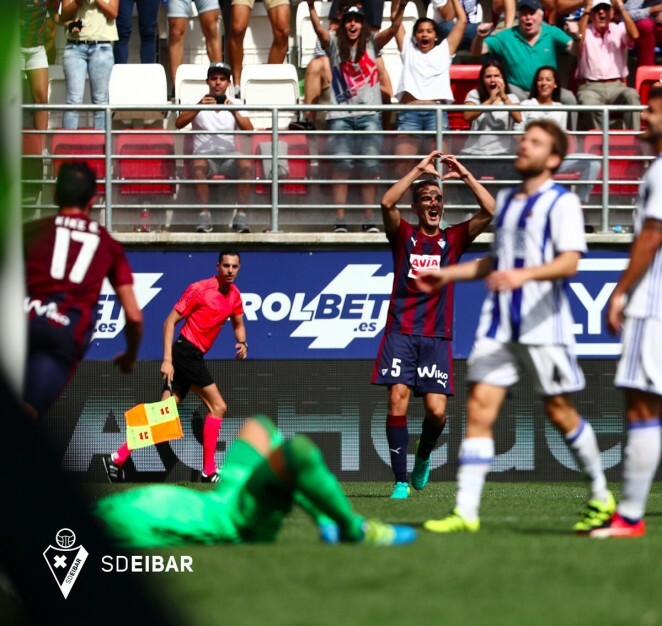 After the interval, Eibar's dominance became even greater and they enjoyed a host of chances to have broken the deadlock. Amongst these was a 52nd-minute Gonzalo Escalante effort from the edge of the box which flashed narrowly wide. Just five minutes later, the hosts made the breakthrough after Escalante broke into the area and saw his shot deflect off Asier Illarramendi and past the helpless Rulli. The goal gave the Armeros a lift and the hosts very nearly doubled their advantage in the 60th minute when some fine individual play from Sergi Enrich culminated in his curling effort crashing back off the woodwork. Just minutes later, a cleared corner fell to Bebé who unleashed a powerful drilled effort which flew into the corner of Rulli's net to make it 2-0 on 65 minutes. The visitors sought to hit back and poured forward in an effort to reduce the arrears, but it was in fact Eibar who enjoyed further chances to have extended their lead. The game ended 2-0 as the hosts retain their unbeaten home record from their three outings at Ipurua this term and end the opening six matchdays with 10 points to their name. Next up for the Armeros is a trip to the Santiago Bernabéu on Sunday prior to the subsequent international break.